Long is the night to the sleepless; long is the league to the weary. Long is worldly existence to fools who know not the Sublime Truth. ~ Dhammapada 60. Theravada Buddhism had existed in Malaysia for centuries among the Thai ethnic community that lived along the peninsula’s northern border with Thailand. A vigorous community, the Thai bhikkhu sangha had a benevolent influence on the other races especially the ethnic Chinese in the northern states. However, due to language and cultural differences, few Chinese ordained into the Thai bhikkhu sangha. Theravada Buddhism only began to have a significant impact on the Chinese Malaysian community early this century as a result of a curious combination of causes. The first Theravada society in Malaysia was the Sasana Abhiwurdhi Wardhana Society (“SAWS”) which was registered at the end of the nineteenth century. Although serving the immigrant Sri Lankans, it was to play a remarkable role about fifty years later. Up till this time, the Sri Lankan bhikkhus it hosted, like the numerous Thai temples then existing, ministered to their particular ethnic community. Ven Gunaratana who after 10 years ( 1958 – 1968 ) in Malaysia, left for USA where he established the Bhavana Society in West Virginia. Ven Wimalajothi (1976 – 1987) who after returning to Sri Lanka set up the Buddhist Cultural Center emulating the techniques he had learnt. Ven Dhammaratana who excelled in social work and set up the Tiratana Orphanage and Tiratana Community Centre in Kuala Lumpur. In December 1976, Ven. 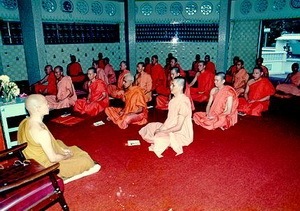 Dhammananda initiated a program enabling Buddhists interested in experiencing the life of a monk to ordain as samaneras for a short period of time. Since then, this novitiate program has been an annual affair and has resulted in several young men taking up the robe as a life commitment. Some of these bhikkhu disciples are pursuing studies in Sri Lanka or residing at the Brickfields Vihara. Elsewhere, other temples set up by Sri Lankan monks also gained popularity. One such was the Mahindarama Vihara on the island of Penang under Ven. Pemaratana who resided there since1957 till his death in 1997. Others are the Sri Lanka Buddhist Temple in the northern part of Kuala Lumpur under the abbot Ven. Saranankara and the Seck Kia Eenh temple in Melaka which although set up by locals have maintained a tradition of inviting Sri Lankan monks as residents. The early years of dhammaduta work in Malaysia also came in the most unlikely person of Ven Sumangalo. He was born in Alabama, USA as Robert Clifton, the eldest son to a Christian family that for 300 years had a tradition of giving its first son to be a Christian minister. However in his teens he decided to become a Buddhist and for a brief period led a Buddhist group in California. Coming to Malaysia in 1957 he was instrumental in setting up numerous youth groups in the major towns and centers of learning. Though few, if any, of these groups remain in their original form, their members became the pioneers of the lay Buddhist movement. In Penang, the Burmese temple and some of the Thai temples had a significant effect on the Malaysians. The Burmese Dhammikarama temple in particular was very popular after Ven.Pannavamsa arrived to take up residency in 1961. His Dhamma classes were very popular and introduced many to the Dhamma. In 1979 he left for Los Angeles, USA to assist Ven.Silananda. One of the several Thai temples in Penang, Wat Ping Ban Onn set up the Malaysian Buddhist Meditation Center with a resident Thai bhikkhu to teach the technique of meditation popularized by the Burmese monk Mahasi Sayadaw. This center is closely associated with many Chinese Malaysian monks particularly those that pursue the path of meditative practice. One of the earliest of such monks is the Ven. Sujivo. He ordained as a samanera shortly after his graduation from the prestigious University Malaya in 1975. During his monastic training he practised under several masters including Sayadaw U Pandita in Sasana Yeiktha in Yangon, Myanmar. Ven Sujivo, more than any other person, is responsible for developing a keen interest in vipassana meditation among a large section of the Theravada community through his teachings, retreats and books. He set up Santisukharama, a meditation center in a rubber tree plantation in Kota Tinggi on the southern tip of peninsular Malaysia. Since then he has inspired numerous meditation centers to be set up by various groups throughout the country and has also extended his teaching tours to East Malaysia and Australia. Another Chinese Malaysian bhikkhu is the Ven Mahinda. While a layman, he was pursuing his tertiary studies in New Zealand when he met an itinerant Buddhist lay-preacher. He decided to quit his final year university studies to follow the preacher on his world tours. He later returned to Malaysia and was ordained under the Ven K Sri Dhammananda. Although he is presently based in Aloka Meditation Center near Sydney, Australia, he makes annual trips to Malaysia to conduct the novitiate program at the Brickfields Maha Vihara. The Ven Katapunna who established Solitude Grove, a small forest hermitage in Penang is also a popular teacher. Before returning to Malaysia he spent several years in Sri Lanka, India and Bangladesh. At present, it is estimated that there are as many as 80 Malaysian bhikkhus, excluding those of ethnic Thai descent. An encouraging observation is that many of the recent ordinations were of young men, several of whom have had tertiary education. However, as the country has no facilities whatsoever for the training of bhikkhus, many of them travel to Thailand or Myanmar to ordain and practise under various teachers. A smaller number who pursue scholarly study are training in the bhikkhu schools of Sri Lanka while the rest reside in various small temples and hermitages mostly in and around Penang island. Till today, there has been no strong initiative to organise themselves or unite into an indigenous bhikkhu sangha. Thus, with the passing of the era of the Sri Lankan dhammaduta monks, the future of the Malaysian bhikkhu sangha may very well rest on the success of the Sasanarakkha Buddhist Sanctuary project. 100 Years of the Buddhist Maha Vihara, H.M.A.de Silva, Sasana Abhiwurdhi Wardhana Society. 1998. Photo 1: New samaneras chanting at main shrine, Brickfields Mahavihara. Photo 2: Ven. 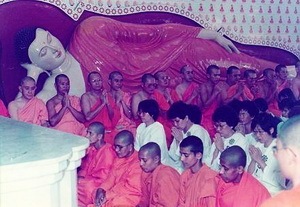 Mahinda teaching samaneras, Brickfields Mahavihara.